"Sketching is one of my passions. I don't feel comfortable when I leave home without a sketchbook and some pens in my bag. I think that my way to put things in my memory is to draw them. And taking pictures isn't the same thing. I live in a very dynamic surrounding — Israel is a warm country with warm weather and warm people. Of course, we have seashores, which calm us a little bit. I love to sit in a corner of some Tel-Aviv coffee shop and explore relationships: between people, their environment, between myself. All this unique local mix of cultures, languages and styles is always a great source for inspiration. You need to be fast, because, as I said, everything is very dynamic. But that's why I love it so much. Sometimes, I look around, and I find some usual items like sugar bags or napkins. I use them in my drawings to show the atmosphere. Sometimes I draw directly on placemats." • Marina's art on Flickr. "The dictionary says that a hobby is “an activity or interest pursued for pleasure or relaxation.” Although urban sketching certainly provides both pleasure and relaxation, I don’t think of it as my hobby. I think of it more as a way of life – something that has become such a normal part of my everydayness that it shapes how I view the world. 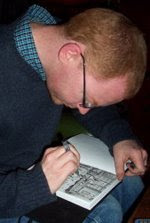 For most of my life I had both the fear of drawing as well as the desire to draw. 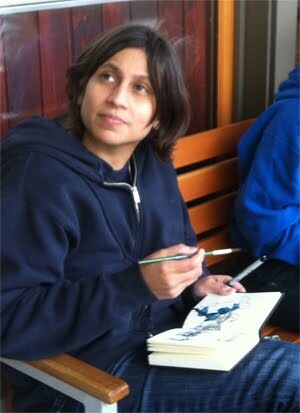 In 2011, inspired by Gabi Campanario’s Seattle Sketcher column, I finally decided to overcome the fear. His drawings of Seattle – my birthplace and lifelong home – were of sights that I had seen many times, yet had never truly seen. I wanted to learn to see, and therefore experience, those locations (and any new ones that I travel to) more completely. 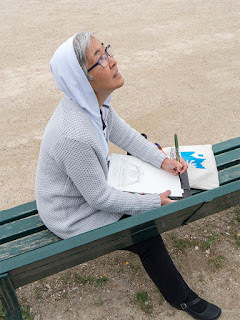 Part 8 of the Urban Sketchers Manifesto, to “show the world, one drawing at a time,” has a flip side: Sketching enables me to see my own world, one drawing at a time. In the last four years, it is not an exaggeration to say that Urban Sketchers has changed my life. I have met and sketched with many wonderful people around the globe, either at symposiums or during other travel, because the USk network brought us together. I sketch almost weekly with my local group, sharing sketches, art supplies and friendship. Even when I stay home and enjoy sketches online, I am still a part of that rich network, learning with every sketch about other people’s lives. In May, my husband Greg and I went to France for the first time, and I sketched the Eiffel Tower. Sketching one of the world’s most famous icons felt like a dream come true – the ultimate in urban sketching. But although I can’t resist sketching world-famous icons whenever I’m fortunate enough to see them, for me, urban sketching is much more than that. Urban sketching is a tree with its middle chopped away to accommodate Seattle’s ubiquitous power lines. It’s about a couple of women chatting over coffee, or about workers roofing the house next door. It’s about an excavator filling a hole where a cherry tree once stood. Or the Tibetan monastery I drive by frequently that I couldn’t resist because it’s bright orange. 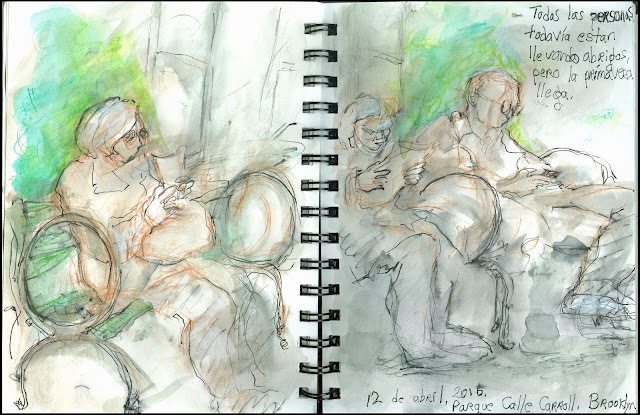 Urban sketching is a string band performing at a local farmers’ market – or perhaps in Villefranche-sur-Mer. 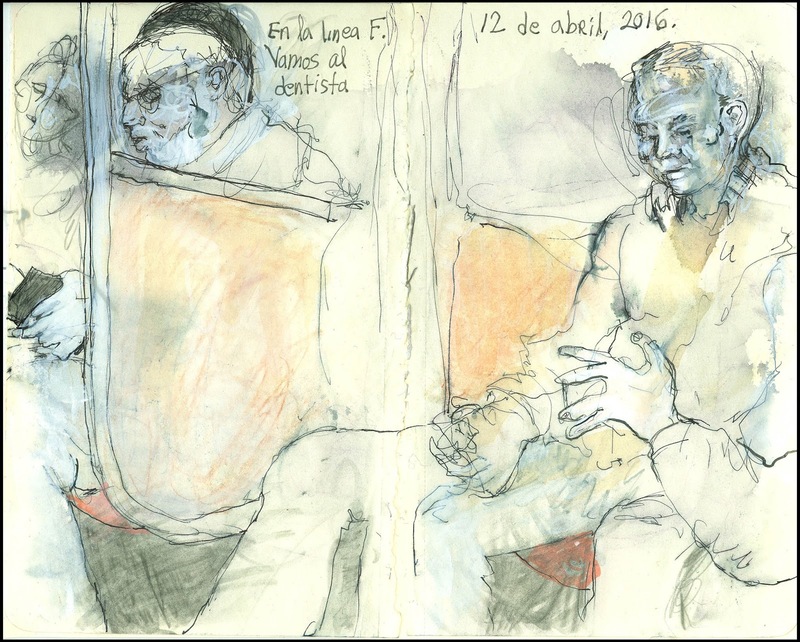 Celebrating the mundane as well as the famous is what urban sketching is all about. My sketches are not necessarily about “special” moments; they are moments made special because I sketched them." Tina has been editor of Drawing Attention since 2013 and now serves on the Urban Sketchers editorial board. See more of her sketches on her blog, on Flickr and on Instagram. "I am from urban north London, but now live in urbane Davis California. I sketch, I write, sometimes do things and go places and my name is Pete. When not Davis, I sketch Sacramento, San Francisco, London, or anywhere else I happen to be. I tend to erase people and cars from my cities, but I'm starting to get over this. Davis: calm, old-fashioned, progressive, quirky, very very hot in the summer. I use micron and copic pens, with watercolour." • Pete's art on Flickr. "I was born in Mumbai (Bombay) and lived in different parts of India until I moved to San Jose, California, where I now live. Travel inspires my art, but, traveling or not, I try to view the world around me as a traveller would; so whether I’m capturing a moment of calm on the banks of the Ganges in India, or sketching over coffee at my local coffee shop, I aim to look deeply, and with wonder, at both the everyday and the exotic, the old and the new. I love color. My sketch kit consists of Extra Fine Sharpies (the fact that they bleed into the paper as soon as they touch it works really well for me—it forces me to work super-quick), a small set of Prismacolor pencils and a little watercolor travel set". 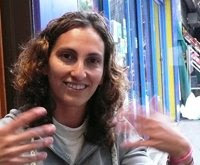 "I was born in Guayaquil, Ecuador, where I studied architecture. 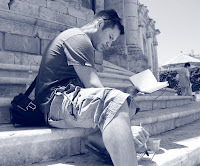 I moved to Kassel (Germany) in 1999 to accomplish a master degree. 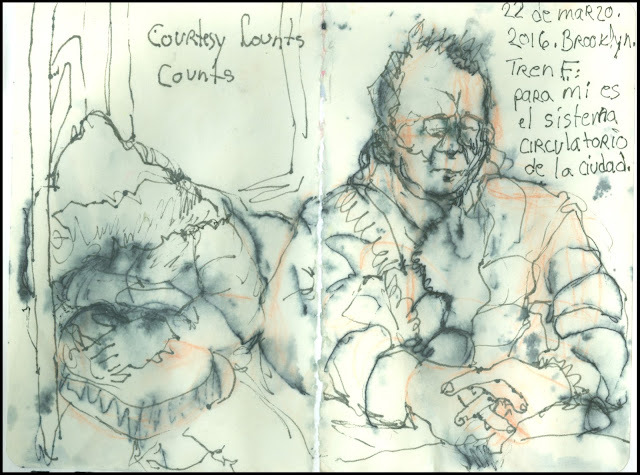 Although I have always drawn and paint, it was not until I started studying in the Uni-Kassel, that I started keeping a travel sketchbook. I had a teacher there who used to do a lot of sketches when he travelled on university excursions. When he retired, I helped to organize an exhibition of his sketches. He brought a huge box full of sketchbooks he had filled since he was an architecture student. I spent a whole day selecting the most interesting drawings. It was a wonderful experience that opened my eyes to a new world. In the last 10 years I have the feeling of being in a long journey. I like to discover the cities where I live, to understand why a place is the way it is and what makes it different and unique from others. Drawing is for me a way to learn to love a place, to become part of it. I like to draw architecture but I am more attracted to urban scenery, portraying how people live in the city. Since I’m a foreigner, everything that locals find normal and taken-for-granted, for me is exotic. I always carry a small watercolor travel set from Windsor and Newton and my sketchbook in my bag. 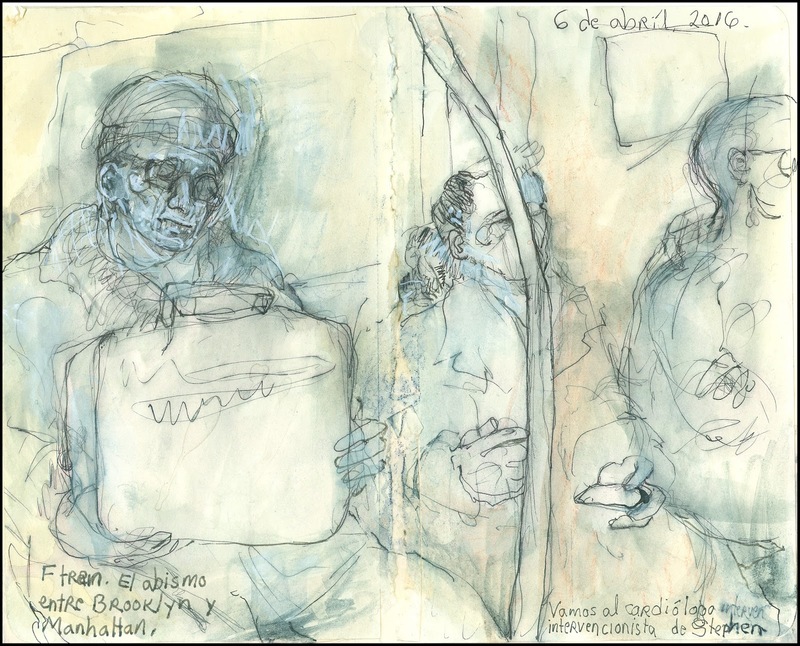 I always thought that drawing was a solitary experience until I found Urban Sketchers. It was amazing to find so many people doing the same thing. It is a great place to share!" • Omar's blog. • Omar's art on flickr. • Omar's website. Transitions: spring and transportation in Brooklyn. The F train: for me it's the circulatory system of New York City. So great to be able to maintain an automobile free existence. The F train: the abyss between Brooklyn and Manhattan. We go to Cardiology. Carroll Gardens. everybody is still wearing coats but spring has arrived, even in Brookjlyn. The F line. I love the train -- the passengers changing with every stop. In New York City each car is a cross-section of the world.